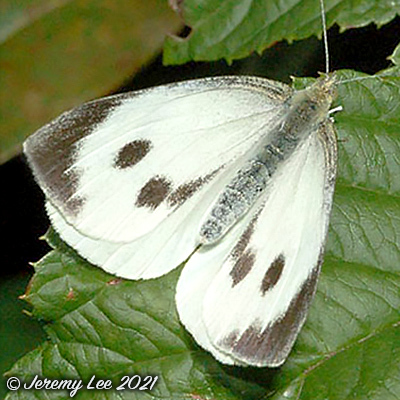 Pieris brassicae, more commonly known as the Large White, has a wingspan measuring 5.3 - 6.5cm. The forewing has a black tip, and, in the female, two further black spots; wing undersides have a yellowish tinge. Found throughout the UK; prefers open areas, and closely associated with agriculture due to its liking of various brassica as food plants. Also very common in parks, gardens, meadows and fields. Mating flight is spiralling and vivacious; copulating pairs often remain joined for quite a long time. Female lays golden-yellow eggs in batches close together on the underside of leaves of the caterpillar's food plants. Yellowish green with black spots of various sizes and yellow lines on the top and sides. Feeds mainly on many cabbage species (hence the popular name of Cabbage White), but also on Nasturtium, Hedge-Mustard and other plants, which can be reduced to a skeleton by the caterpillars' activities. The young caterpillars remain together at first, but disperse later.